Teppet er designet av Lynette Anderson, og jeg har brukt mine egne stoffer. 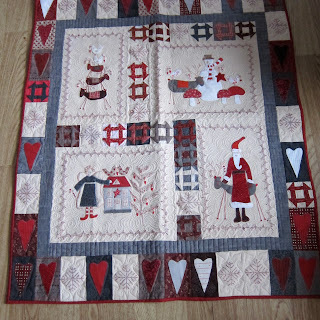 Finally a picture of my red Scandinavian Christmas quilt. 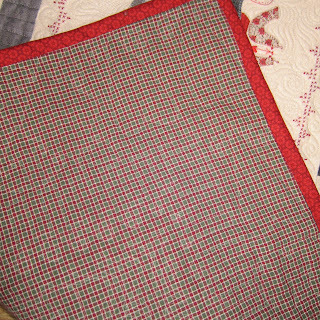 It has been machine quilted by Merete www.sy.no. The quilt is designed by Lynette Anderson and I have used my own fabrics. Nærbilde av engelen og qultingen. A close up of the angel and the quilting. Et nærbilde til. Another close up picture. Dette er baksiden, mangler bare navnelappen og den ligger hjemme ferdigsydd. This is the backside, the label is at home ready to be sewn on the quilt. Jeg håper å få det blå teppet ferdig til skolestart. I hope to have finished the blue quilt when school starts in august. Thanks, Ulla. It feels great. The woman who quilted it is very clever. I thought I had done enough cross stitches for this year until I started on "Stitched by Me" one of the blocks has the same boarder.